The Carnegie Public Library Children’s department recently held a four-week class for third through sixth graders encouraging STEM education while building with Lego blocks. STEM is an acronym for Science, Technology, Engineering, and Mathematics, which are four subjects students need to master in the modern world. Charlie Reeves (on the left) built this car, which uses a crown gear to change the direction of his motor’s axle. The car also has a simulated piston system. Isaiah Wynne (on the right) experimented with different gear ratios so his vehicle can be converted to either a fast moving car or a strong pushing bulldozer. 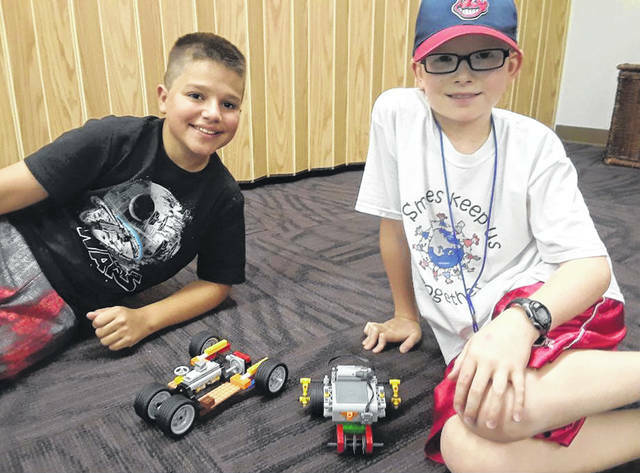 https://www.recordherald.com/wp-content/uploads/sites/27/2018/07/web1_Charlie-Isaiah-Cars.jpgThe Carnegie Public Library Children’s department recently held a four-week class for third through sixth graders encouraging STEM education while building with Lego blocks. STEM is an acronym for Science, Technology, Engineering, and Mathematics, which are four subjects students need to master in the modern world. Charlie Reeves (on the left) built this car, which uses a crown gear to change the direction of his motor’s axle. The car also has a simulated piston system. Isaiah Wynne (on the right) experimented with different gear ratios so his vehicle can be converted to either a fast moving car or a strong pushing bulldozer.